24 year Old Telugu Actress Lavanya Tripathi wearing a Yellow Half Saree with a sleeveless Boat neck Brocade Blouse with Mango Motif Design during the ‘My Freedom My Gold Offer’ event organized by Freedom Sunflower Oil. She paired it with white Bangles and open hair which made her look stunning. Tollywood Actress Kratee Glamorous Photos in Cream Half Saree with wide Golden border and a Bikini Blouse with Gold Sequin work on it. Kratee wearing a Saree below navel. she also wore a Gold Jhumka’s with straightened hairstyle. Actress wearing Sarees below navel in sleeveless blouse. Actress SriMukhi wearing a Purple Half Saree with Half Sleeve Blouse with sequin and embroidery work with embedded stones on the neck. Round neck Blouse Design with a Transparent pallu and and Gold border makes her look beautiful during the music launch of Dhanalakshmi Talupu Tadithey. Telugu Anchor Syamala in a Pink Designer Half Saree with with Pink and white with a thin golden zari border. Half Saree Patterns for South Indian women. Paired with a Short sleeved embroidered blouse with wide Neck with Golden Zardosi work on it makes it look attractive. Television Actress Rashmi Desai looks stunning in Orange and Pista green Half Saree during the Dussehra festive season in a VARIJA creation. Rashmi Desai was wearing a designer Half Saree with glittering embroidery in white color on Lehenga, paired with a Orange pallu and Pista green short choli with short sleevesa nd a V Neck Shaped Choli. This outfit is perfect for a Party Wear or festival and is designed by Varija Designer Studio. Designer Lehenga Saree in Yellow And Pink color with resham and patch border work with a short navy blouse blouse with Pink neck border and mirror work on it. South Indian Style half Saree model in Lehenga Style for Indian women those who wants to look modern being traditional. With yellow Lehenga with Patch work and Pallu with Mango design border in resham embroidery and chamki work all over the pallu with a mix of green thin border gives this Saree an ethnic look. This is perfect oufit or Party or wedding. Latest Designer Blouse to be worn on Half Sarees. H Saree are more popular in India and comes with a sewed pullover. Half Sarees comes with a blouse which is mostly worn on festive season or weddings. Mostly worn in Southern part of India, Half Sarees have been popular across the world in 2015. Actress wearing Orange Green Half Saree with stylish embroidery and Back design with Mango motifs and deep back visible in the blouse. Best to be worn in weddings and Parties. 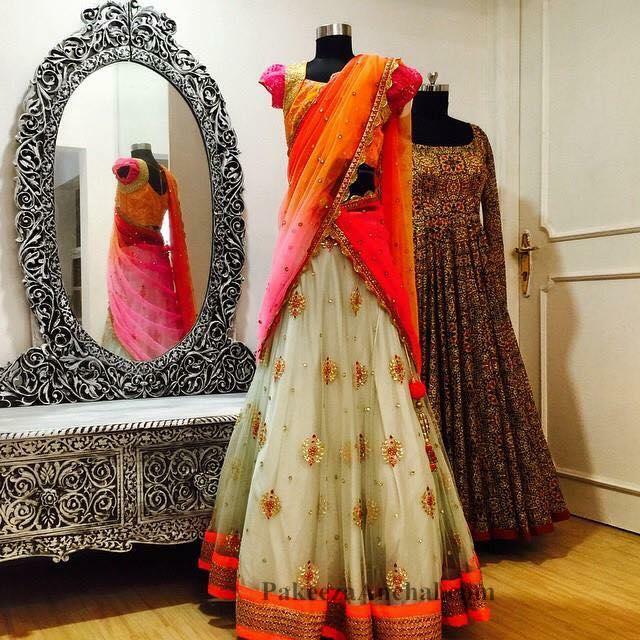 Latest Designer Wear Half Saree Dress for Party Wear by One of the famous Hyderabadi Fashion Designer Bhargavi Kunam, Half Saree is designed on a light cream color Lehenga with contrasting Orange color Border and Matching Blouse and Dupatta. Half Saree Blouse is in matching color with Puff sleeves and shaded dupatta in two colors.